What is your current weight after your gallbladder surgery? Have a Blessed 2015 to all people without gallbladder! The company that I am currently employed, gave us some food treat – lunch at Pizza Hut. 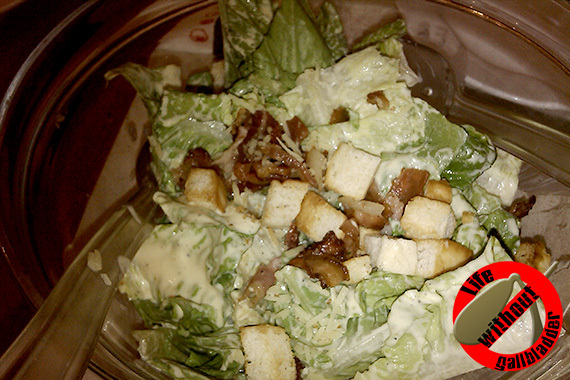 Part of the combo meal that we ordered was the Caesar Salad – 2 bowls of green leafy vegetables with topping and dressings. It has crisp romaine lettuce, bacon crumble, parmesan cheese, and herbed croutons tossed in Pizza Hut’s own Caesar dressing. I am not a fan of this kind of food but for those vegetables lovers, I think this feels like heaven for them. I tried it though, but with just a few leaves and I was done. I was able to eat this vegetable salad even if I no longer have gallbladder. There’s no side effects that I encountered afterwards. No upset stomach, no bloating whatsoever. It may be because I only ate a little. My colleagues were also not into veggie salad. That left the other bowl untouched.